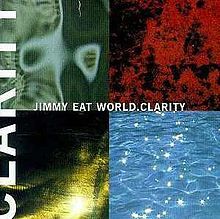 Clarity is the third studio album by American rock band Jimmy Eat World, released on February 23, 1999 through Capitol Records. Overlooked upon its release, Clarity has since amassed cult status and critical acclaim, often lauded as one of the best records of the 1990s. Praise centered on its dynamic instrumentation, as well as the heartfelt delivery of singer-guitarist-lyricist Jim Adkins. Various music critics have credited the album for serving as a huge influence on modern-day emo music. However, despite critical praise and promotion of the single “Lucky Denver Mint” in the Drew Barrymore comedy film Never Been Kissed, Clarity was commercially unsuccessful in a musical climate dominated by teen pop, and the band was dropped from Capitol Records the following year. After being dropped by Capitol, the band used this time to undertake extensive touring which allowed them to self-fund recording sessions for their eventual mainstream breakthrough, Bleed American (2001). The album was remastered and re-released in 2007, featuring additional bonus tracks. Two years later, the band released Clarity Live (2009), recorded during its commemorative tenth anniversary tour.